With this release we have added functionality for you to tag friends in your logs on Geocaching.com. Here’s how it works. 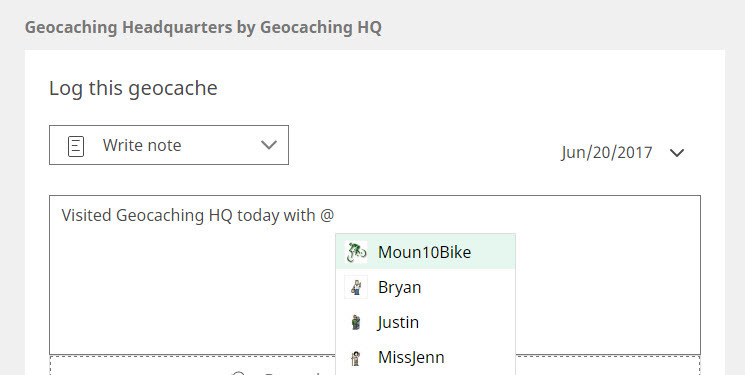 When logging a cache on the website, hit the @ key and a list of your Geocaching.com friends will appear. Choose the friend you wish to tag. Submit your log. The tagged friend(s) will receive an email notification that they’ve been tagged in a Geocaching.com log. This functionality is currently only available when logging caches via the website. Sean B and Alex from HQ’s web team are watching the thread to answer questions whenever possible. You can currently tag somebody in an unpublished cache which seems a bit strange. Perhaps tagging should be off until it's published? You can't actually see the log or the cache details from what I can see, so it really doesn't hurt other than generating an email the tagee can't follow. BTW, nice to see some additional functionality added to the friends feature! I don't think I'd be using it much, but we'll see. I could see people wanting to create a "friend group". So if I went caching for the day with cachers X, Y and Z and found 50 caches, I might want to define my own group to auto expand into X Y and Z so I don't have to keep tagging them, assuming that's something I'd want to do. Basically, it would act as a temporary macro. Go to my friends list, click the ones I want, click "create group", enter a name, then use @sundayfriends to auto expand into X Y and Z. Possibly this would be very annoying to X Y and Z though to get all those emails! I predict the notification emails will get old pretty quickly, especially when my caching partner tags me in every log for caches we find together. Can you please provide a setting to turn off the notification emails when we're tagged? On by default should be fine, but there should be an option to opt out. Could you elaborate on what isn't working? If the dropdown list isn't appearing, check if you have friends added here: https://www.geocaching.com/my/myfriends.aspx. The dropdown will only populate with your friends. If the dropdown is appearing, you'll need to explicitly select a user to mention by either clicking from the dropdown or navigating the dropdown with arrows keys and hitting enter on the selected user. You'll see a background color change on your log text to indicate that a mention is recognized. Thanks for the quick feedback! We're definitely looking into settings to turn off notifications for these emails. I can't promise a timeline, but we're hoping to update this relatively soon. I'm guessing you can't tag the C/O or other members who aren't on your friends list. I don't tend to add people to my friends list but I do mention other cachers in my logs in some sense. A step in the right direction though, I've been wondering when this would be added. It does not seem to work when i edit a will attend to tag my friend? Yea, it gives only 10 items in the list, I was puzzled as well since I did not see my friend there. But I continued typing his nickname and the list kept narrowing down until there was only his name. Then I got him into the text using ENTER key (the mouse works too). But it is highly unreliable, worked for me only twice during my testing. Even the 10 items list itself does not show up again if I delete the nick in the middle of typing using DEL or ESCAPE and I have to reload the page again to restore this function. Yea, it gives only 10 items in the list, I was puzzled as well since I did not see my friend there. But I continued typing his nickname and the list kept narrowing down until there was only his name. I saw some of this myself. The first time I used it, I typed @, got a list of ten. I had to type 4 letters to get the person I was looking for to show up. The second time I did it, I only had to type their first letter to show up. The feature is a neat idea. Can you implement the ordering of the list when you type @ like the lists feature? IE, the one you chose most recently automagically appears at the top of your list? Thanks for this feature, works fine! Mmm, this may be a stupid question.. but what is this feature good for? The name of the companion can also be written per keyboard and may be as fast as this feature. On the other hand why should I want to know if someone is mentioning my user name in a log? Thanks for the feedback! Here's some information to answer some of your questions. We'll look into adding notification settings to disable mention notifications. We'll look into disabling mention notifications by default for non-cache owners and non-reviewers for unpublished caches. We only display 10 friends at a time. This is to avoid cluttering the page with a giant list of friends. In order to filter down the list, continue typing your friend's username and it will filter down. I've jotted down the idea to look into displaying most recently mentioned friends first. There are no current plans to add mentions to the edit log page. This may change in the future, but is not in high priority. Edited June 21, 2017 by ????itschautime?? The idea is to be able to tag friend(s) if you're geocaching in a group. Take this example: two people were geocaching together, but only one person could record which geocaches were found. The person recording could mention the other in all their logs. The person who was not recording can now easily see which caches they found together(and log em of course!). Hm, yes, a good use for this feature, actually. Any plan (or way) to expose it through the API though? My girlfriend is usually behind on her logs...she simply brings up my profile page and uses that to see what caches we found together...so I'm with fraggle...what is this feature good for? I could see how it might be used if you found a cache and think your friend would really like it you could tag them. Hmm, that's something I did for YEARS already And easier, too! Just going through the list of their last finds. The ones I haven't been logging yet simply are the ones not yet highlighted. I would prefer one more option: Disabling being available in the tagging list But that's easy, too. Simply unfried my friends. I'm doing a tour tomorrow with three of my caching friends. We want to end up with at least 50 finds. In that case I would get 150 notifications that I have been with them to some caches? Do your really believe that anyone will read more that 3 or 4 of these logs before they start deleting all of them? And besides that I usually first write some common log part with the info whom I was with and use that as kind of a template and simply copy that to every log. I guess that this prevents that new function to work at all the other caches than just the first one. And I guess I'm not the only one doing it that way. While seeing the newer features I pretty often was thinking about the fact that being a programmer doesn't necessarily mean you're a geocacher, too Just wonder if you guys are doing that on a regular base to get an idea what people really want to see as features. I know that some of you lackeys have high found numbers, couldn't you just discuss your new ideas with these guys first to get an idea if you're doing the right things? And sorry to said it that direct, but why don't you first solve the issues you introduced with the new log feature before adding even more (half ready) features? 1.) I'm missing NM and NA log types as option and I'm not the only one missing it. 3.) I can only use ~1/3 of my screen width for editing. I simply wonder why this couldn't be more one wider screens, adjusting automatically. Please understand that as what it shall be, comments from a long time geocacher who wants to be able to use the right tools to be able to play that game as best as possible! Sorry, but if I really like a geocache it gets a favorite point And as my friends know what I like they simply could look up my list of favorites. I personally see any (good) us of that feature for the moment, I only see loads of spam possibly coming to me Hope these emails will be easy to recognise to be able to right away delete them by rules as long as there's no option to get rid of them! I would say that this only applies if they don't speak to each other. I suggest looking at the friends finds would accomplish the same end and simpler than a shed load of notifications. It speaks volumes when people scrabble around looking for ways a feature can be used. That most definitely implies there was no good use case in the first place. The friend tagging only happens if "@" is typed before a friend's username. If you want to mention the other cachers in your group, then just do the same thing you've done in the past - type their names without the "@" symbol at the beginning. Then they won't get 'tagged' and won't get any notifications. I am surprised. I would expect that the edit and the log functions already share a lot of code, in fact I would expect that if you update the log function (say you fix a bug) that you don't have to think about updating the same thing in the edit function. In that case it could be even so that adding this to the log function would have added this automatically for the edit function, otherwise it shouldn't be a lot of effort (if you designed the site well). This is an interesting change to the logging process. I don't make use of the Friends feature, although I have accepted a couple friend requests. I'm not particularly bothered by the additional of this feature, although there are other changes to the new logging experience that I would've liked to see first - adding the ability to add photo captions, providing the option to clarify the canned NM/NA text, restoring the ability to add coords, clarifying the separation between the cache name and CO. NOTE: I do see that the labeling was changed to "Report a Problem". Thanks for that! I noticed that for some friends the tag is turned into a link, but for another this wasn't done. Why not? And I also can't believe that anyone else really would like it. In the first moment it sounds nice, but what if one gets dozens of such emails every other day. Does anyone really believe one would read all these? I don't think so! This statement is concerning. How is there any difference in code/functionality for the same component/function used in different areas? We've been told the main driver for all this change is correcting years of coding changes that slowed development and was error prone due to complexity and redundancy. The same enhancements and defects must still be addressed in multiple places. Exactly so we get rid of nice old features and add new features of debatable value. In the process we write shed loads of new code that doesn't work fully and isn't modular. Yeah! The way understand it may be... if the edit is more of a direct data modification, which isn't using the API (at least in the same way) as submitting a new log. Eventually, the edit function may be 'updated' to work with the same system the new log page uses, but right now, with the edit feature not in the same api space as the new log, even though the data ends up in the same storage, the filtering would be different for both (to aid with rolling out more modularly). And if they're rolling out page by page, desiring to leave the log Editing until the New log is acceptably sufficient, then the content filtering will be different until that point. Sort of like they have logging interface V1 (the old new & edit pages), V2 (the current edit page, which gained markup recently), and V3 (the New log page). Each took submitted data and saved it to the same final location, but each had different content filtering code. Presumably, the ideal to eventually move the current log editing page to the V3 interface, at which point both new and edit will apply the same tagging/filtering/notification functions. That's how I'm grasping their process anyway. The statement was there are no plans to include support, not that edit will gain the same front-end functionality at some point. With some proxy functionality GS has implemented, I'm no longer able to create/edit logs at my office to validate behaviors. Yeah, but keep in mind "no plans" is marketspeak to leave the door open; doesn't mean never, but it could mean never, or it could mean it'll come in time but without any form of confirmation now. Either way, as you quoted my 'grasp', it still leaves from for 'never'. Edit may never move from V2 to V3. Or it may. Or it may but without employing the New Log filtering. Who knows. I find it hard to believe that the log editing will never gain at least the same filtering framework as the New Log function, even if a specific feature like tagging notifications aren't implemented. Seem like logging and tagging is moving towards functionality similar to FB posts or Instagram posts. Notifications, well, as long as they provide the option to turn of notifications of tags, I'll be content. Well, I suppose that's another reason not to enter low-content logs in the field, planning to edit the logs later when you have access to a real keyboard. This is pretty close to the reasoning for not adding mentions to the edit page. When we released the new log page, we overhauled (most of) the legacy systems that post logs to the DB and the edit log page hasn't been updated to leverage the new services yet. That project is not up to one person to decide so I don't have an answer for when that might be done at the moment. To clarify my answer about the use case for mentions: Tagging friends that you've found caches with was the original intent that spawned the idea of mentions. This is by no means the official use case of mentions. I anticipate the community to use this optional feature in any way they want. Just tried it and it seems to work fine, just not sure I would ever use it. It's pretty academic for me though 'cos I dumped all my friends when they redesigned the dashboard and I was getting inundated with unwanted notifications and I don't see myself adding them back, but I was just trying to explain one possible use for the feature. Well, they did mention in post #7 that they're planning to include the option to not receive notifications. Personally, I'd prefer that such options are made available at the same time that the feature is released, but that's just me. It's not something that I would use, but I wouldn't be surprised if some cachers have asked for such a feature. I've noticed more social-related requests appear in FB and Reddit forums than in this forum platform. Sorry, but if I really like a geocache it gets a favorite point And as my friends know what I like they simply could look up my list of favorites. I personally don't see any (good) use of that feature for the moment, I only see loads of spam possibly coming to me Hope these emails will be easy to recognize to be able to right away delete them by rules as long as there's no option to get rid of them! Ok, I'm sorry, didn't want to offend you! I just don't really get any good use of that feature. I just don't believe that anyone would really check these emails after finding out that probably 90+ % of them are more like spam. And I bet it will be like that finally! I could see people wanting to create a "friend group"
How about something like "team field notes"
A group will grant each other permission to have a list on their log page that works like the trackables dipping, except it shows all the other cacher accounts that have proactively granted permission to appear on the list. You can "dip" the other cachers, except that instead of logging a find, it sends them a field note; this still puts the onus on them to transform it into a find. Sorry -- the quote lacked context. It was proposed as a solution for one-off group caching trips, to facilitate ease of logging within the group. This tagging feature might be a step towards facilitating that sort of functionality. That could be useful, if the others who went on the geocaching trip are already members, and they're on my friends list. If they're newbies who haven't created an account yet, or if they have an account but they aren't on my friends list, then I'll have to share the list the old-fashioned way. I still don't really get it... Don't you think this feature only might make sense as long as you can be sure there's just ONE person out of the team doing this? And it also only makes sens to send field notes to someone who hasn't been logging yet? To me it looks like there are too many "ifs" in this scenario. I'd like to see an option on the iPhone app to check in users you are with so the cache logs to their account as well and everyone doesn't have to have their app open and whatnot! I kinda understand the 2013 request. Let's say Jack and Jill go caching together, and Jack is the one with his phone out to say '30 ft over there'. Both Jack and Jill search and sign the logbook, but Jill doesn't want to take our her phone to open app -> load up the cache -> submit log or save draft. It may not be 'laziness' on Jill's part - maybe Jill's phone battery is too low OR maybe Jill has her hands full with their dog/child. In such instances, Jack can 'tag' Jill in his log. Then Jill will have all of those caches in her email, so that she can log them individually. Of course, that assumes that the email notifications arrive in the correct order that Jack logged them. If it was me, I would still go to Jack's profile to see what order the caches were logged, but that's because I like to keep my logs in the correct order within a day. Besides a Jack and Jill scenario, it could also be a Parent/Child situation - where the Parent handles the phone and 'tags' their child's account. Again, it's not a feature that I would use, but it seems some cachers like the social aspect of 'tagging' and 'friends'.